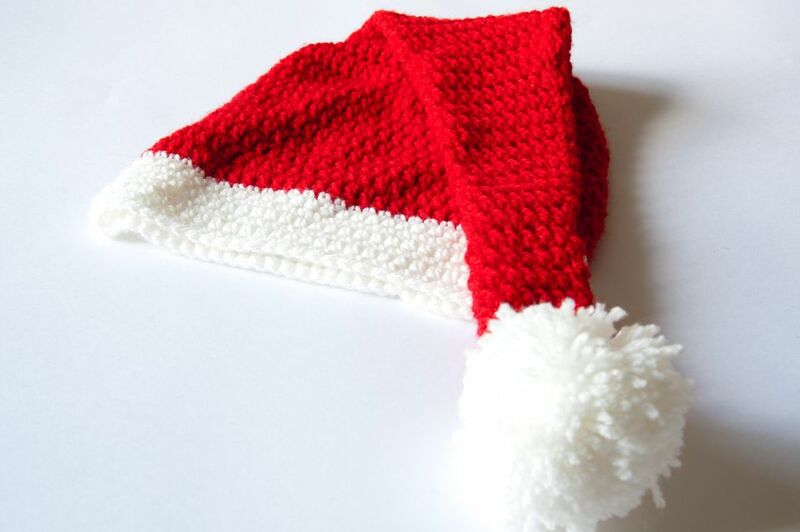 This super-fast knit Baby Santa Hat is strictly for the little ones. Great as a festive accessory to keep warm when out and about, or works well as a photography prop too. Finished hat circumference: 12 (14) inches; to fit a preemie (baby). Instructions are given for the smaller size first with the larger size in parentheses. On size 11 needles, cast on 24 (28) stitches in Bernat Baby Blanket and join in the round, being careful not to twist. Work in Garter Stitch (1 row knit, 1 row purl) for 2.5 (3) inches. Join red yarn and change to size 8 needles. Increase round: Knit in the front and back in next 2 stitches, make 1, *kfb in next 4 stitches, m1. Repeat from * to last 2 stitches, kfb in next 2 sts. 54 (63) stitches. Work in Stockinette Stitch for 1.5 (2) inches. *K7, knit 2 together. Repeat from * to end. 48 (56) stitches. *K6, K2tog. Repeat from * to end. 42 (49) stitches. *K5, K2tog. Repeat from * to end. 36 (42) stitches. *K4, K2tog. Repeat from * to end. 30 (35) stitches. *K3, K2tog. Repeat from * to end. 24 (28) stitches. *K2, K2tog. Repeat from * to end. 18 (21) stitches. *K1, K2tog. Repeat from * to end. 12 (14) stitches. Thread yarn onto yarn needle, thread through stitches and pull tight. Pull yarn through to the wrong side. Make a pompom, the simplest way is to use your fingers. You can use the same Bernat yarn used for the brim of the hat, or different white yarn if the chenille is too tricky to work with. 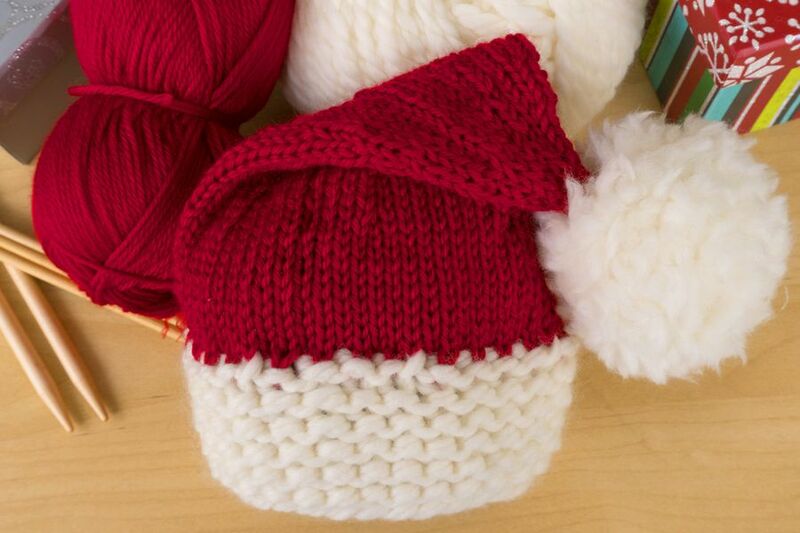 Attach pompom to top of the hat by pulling its ties through to the wrong side and tying them together with the red yarn already pulled through. Weave in ends and block/shape if desired.